Nice decorations in red and green started to appear in the streets at the beginning of November. Despite knowing that majority of UAE population are muslims, some new expats might have thought how nice it is to hang festive decorations for Christmas. 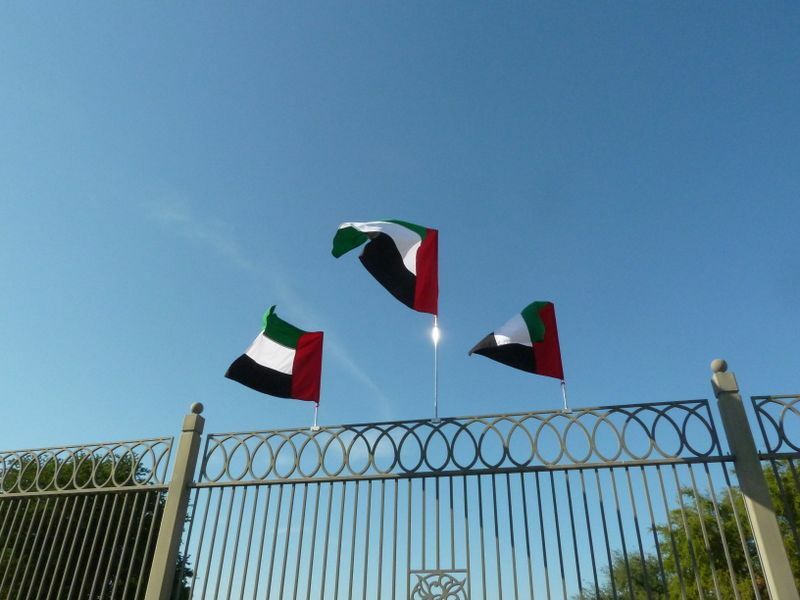 Then the UAE flags (white, green, black and red are national colours) showed up out of nowhere and they are everywhere, every building has one or five. Emiratis prepare to celebrate the 42nd National Day. On 2nd December 1971 six sheikhs signed the UAE federation (Abu Dhabi, Dubai, Sharjah, Ajman, Umm al Quwain and Fujairah) and the seventh (Ras al Khaimah) joined them in February 1972. So everything is now decorated, especially cars which are either fully covers in stickers and posters and/or have flags all around. Looks nice, gives a comfy festive mood. And maybe they will keep the decorations on until Christmas. 🙂 My sice mame volno iba zajtra, ale domaci uz dnes. Predchvilou sa vonku zase jasili lietadielka a vecer fotim zo strechy ohnostroj. potom dohodim aj fotos, ak sa zadari.